The 2014 Lexus IS model is a popular entry-level luxury sporting sedan that is bestowed with an immaculate handling, lavish interiors and an all-inclusive list of high-technology gadgetry. The I.S. brand was completely refurbished from 2006 onwards by absorbing design cues motivated from the larger GS sport sedan. Since then, the I.S. has enlarged its portfolio to include the 350 variants apart from making the existing 250 model available in an all-wheel drive format (A.W.D). The turbocharged engine of the IS 250 along with the standard six-speed manual transmission packs in enough punch to enjoy a pleasurable driving experience. 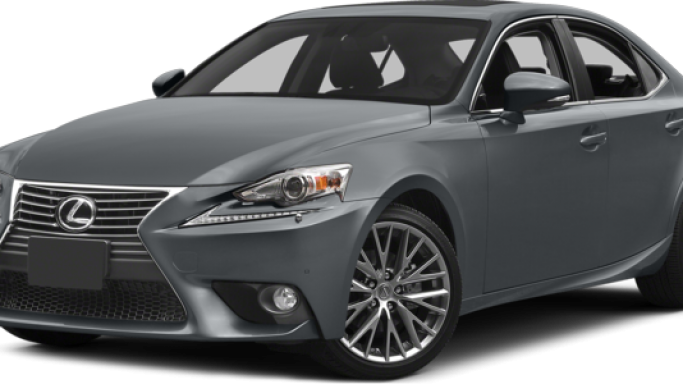 The entry level variant of the IS 250 is ambitiously priced at just over $33K and has a reasonable fuel economy rating of 21/17mpg on highways and city roads. The IS looks stylish and elegant through its front bumper and accentuated grilles. The car is also configured with daytime LED running lights, which ensure that the IS looks even more spectacular at first glance. The rear body coating and fog lamps are polished and sporty. The Chrome effluent taps and other outer body design cues contribute to a profile that is not only visually captivating but extremely aerodynamic. The turn indicators are joined with side-view mirrors to assist in signaling approaching cars from either ends. Inclining rear-view mirrors are joined to the gear shifter and slant when the car is parked in the reverse direction. The IS 250 is replete with standard 17-inch alloy wheels with an option for 18-inch alloy wheels also available. The Hi-Intensity Bi-Xenon headlamps are more effective than the traditional halogen ones since they utilize less energy and are long lasting. An inbuilt -auto positioning feature helps to ensure that the headlamps are inclined at proper angles. LED brake lights provide added safety as they light up faster than traditional bulbs, and help drivers tailing the car to view it better and respond in emergency situations faster. As mentioned earlier, the I.S. is manufactured in two different models, the IS 250 and IS 350 that are both rear-wheel-drive enabled but can be upgraded to an all-wheel-drive and a heavy duty F Sports package. The IS 250 is muscled by a 2.5-liter V6 that delivers a whopping 204 horsepower and 185 lb-ft of torque. The power rating deliverable by the IS 250 is much less compared to what is offered by some of its closest competitors. However, the six-speed transmission is a smooth operator that creates its power in a sophisticated manner and delivers the much-need thump to the car’s performance in trying conditions. The I.S. 350 is fitted with a 3.5-liter V6 that uses a unique port and direct-injection system to deliver 306 hp and 277 lb-ft of torque. The car has a mileage of 19/28 mpg (19/26 mpg with A.W.D) and fares slightly better in fuel economy rating than its lesser powered sibling. The IS 250 is embroidered in a mushy, leather-trimmed interior, which includes a shift knob that is also draped in leather and steering wheel with in-built audio controls, as well as a dashboard with sliding armrest, storage case and accessory outlet. Silver-trimmed shades on the glove-box, control buttons, tachometer and speedometer add a touch of classiness and style to the dashboard. Notwithstanding the weather outside, the warmed and ventilated front seats ensure that every passenger feels snug every time they travel in the vehicle. A novel Sound-absorbing Sunscreen has been incorporated to diminish exterior noise and provide a quieter in-car atmosphere for cherished conversations and music. The accessible voice-identifying routing system on the IS250 has a touch-screen for entering data and instructions, in addition to an sophisticated voice-command system that enable passengers to search for destinations by communicating instructions to the system during driving. The system also feature intuitive apps like Nav-Traffic and Nav-Weather that are skilled in providing a plethora of meaningful information to the passengers like real-time surrounding weather conditions and traffic jamming reports. Posh Mark Levinson Surround Sound audio system with fourteen speakers and 340 wattage of power guarantee premium music streaming experience while driving.